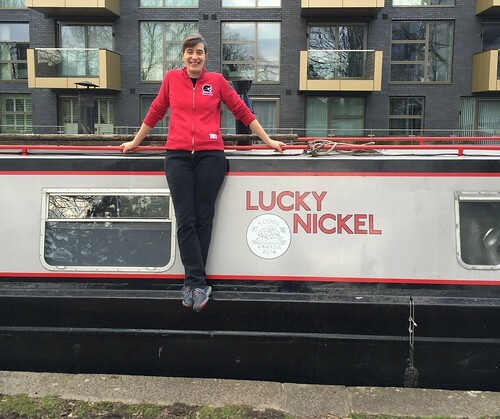 It’s an exciting time here at Go Stay Work Play Live World Headquarters, aboard the "Lucky Nickel". This week, I engaged the services of a talented young woman to paint the name and logo on the side of the boat! Astute Go Stay Work Play readers will recall that when I bought the boat it was named “Dragonfly”, which one might think is a nice name for a boat. And if one did think that one would certainly not be alone in one's thinking because a quick search reveals that there are over a hundred boats registered in the UK called “Dragonfly” or some derivative of that. 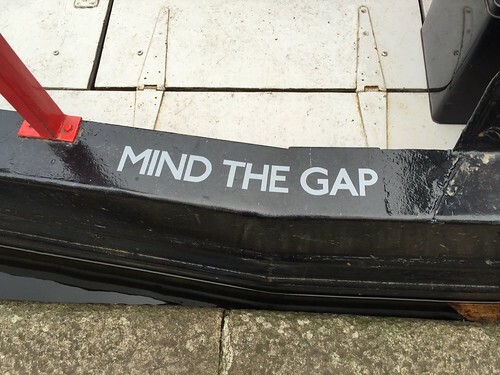 It is surely one of the most common boat names in the country. So it didn’t take me long to decide that along with repainting, my boat was going to be renamed, and I settled on the new name more than six months ago. Sure, there's a superstition about it being bad luck to change the name of a boat, but I hold no truck with such things. Besides, records that came with the boat indicate that it started life as the “Lisa Jane” and was changed to "Dragonfly" at some point along the way, so really the damage was already done. Also there’s a school of thought that if you’re going to change the name you should do it when the boat is out of the water being painted, which I did, so I think I’m covered. The question then became one of how to get the new name properly displayed on the boat. I’ve been on the canals full time for more than two months now I’m a little surprised at how many boats I see with no name visible at all. I find this odd and a bit sad. I suppose different boatowners have different priorities but honestly, have some pride, people! For a long time I’d planned to simply have a custom vinyl sticker created from an online company like this one. It seemed like a reasonably economical way of achieving the effect I was looking for, and they even promised they could take a digital image file of the nickel and create a sticker of that, along with the lettering. Job done, I thought. 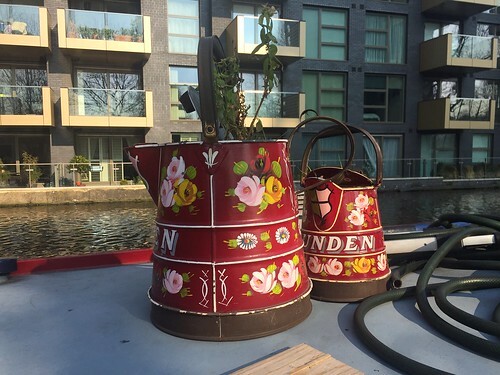 First, though, let’s have a little sidebar and delve into the rich and colourful history surrounding the painting and decoration of narrowboats. And when I say “colourful history” I am definitely not speaking metaphorically. 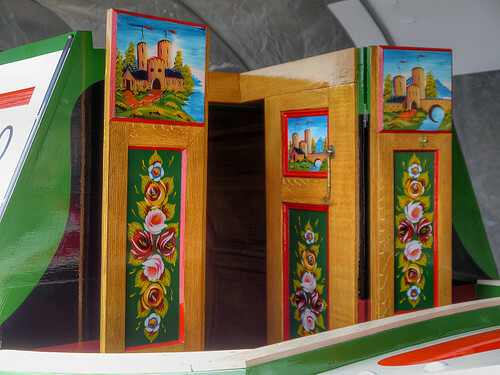 Traditionally, working narrowboats operated and inhabited by bargemen and their families were be heavily decorated in what’s come to be known as the “Roses and Castles” style, which AGSWPLRs might suspect runs heavily to… er… roses and castles. And of course they’d be right. I told you it was colourful. At the peak of the working canal system - when narrowboats moved the raw materials and products of the Industrial Age along England’s canals, most bargemen were well-paid enough to hire on help and keep their families on dry land in canal side cottages. However, the arrival of the railway brought a new way of moving cargo and a consequent decrease in the demand for and the earnings of bargemen. As a result, many a bargeman was forced to give up his paid help and move his entire family into the cramped and dirty cabin at the end of his boat. This had the twin advantage of reducing living costs and providing free labour to help in working the boats. But life with no fixed address made it difficult to keep children in school or develop community ties, and barge families gradually came to been seen as “apart” from normal society. One can certainly imagine that it might be nice to be surrounded with such colourful and romantic images given that life on a working boat was hardly a bed of roses. Or even a bed of castles, for that matter. Heavily decorated boats are not as common as they once were, but there is still a significant part of the boating community that carries on the Roses and Castles tradition to a greater or lesser degree, and chandlers that serve the canal trade often stock painted canalware like mugs, creamers, spoons and the ever-present Buckby Can. Before the modern era of us pampered boat dwellers with our giant below-decks water tanks and hot water heaters and such-like, clean water was stored in a metal tin called a Bucky Can, normally stored on the roof of the boat and refilled at infrequently located towpath standpipes. (Actually, the infrequently located towpath standpipes are still the only source of clean water…) Just as with everything that wasn’t nailed down (and many things that were) Bucky Cans were also heavily decorated. I suspect no one reading this will be surprised to learn that Roses and Castles is not exactly the aesthetic I’ve been trying to achieve on the “Lucky Nickel”. It’s clean and tidy and modern, and I like it that way. Then again, if you were fortunate enough to be invited on board you might glimpse one or two nods to the old traditions tucked away. 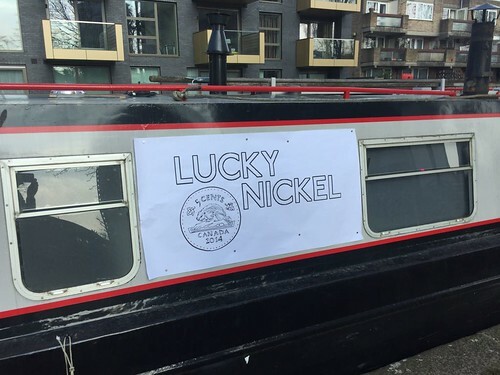 And now back to the “Lucky Nickel” and the question of how to properly adorn the boat with its proud new name. 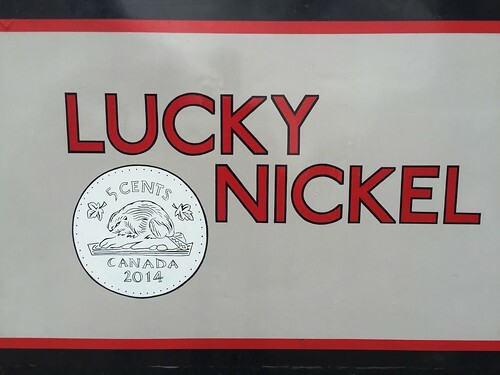 Even if I was to order the vinyl sticker I’d still have needed to pay a graphic designer to do a proper high resolution cartoon of the nickel image, and that was going to add to the cost of the vinyl option. 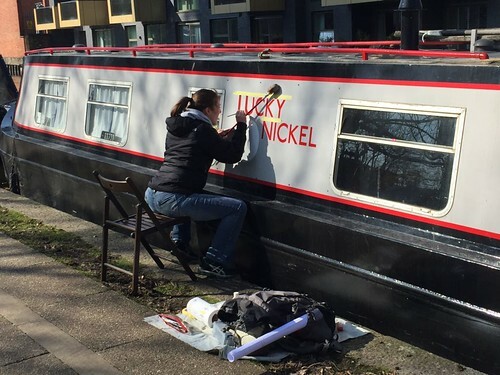 Then I happened to pick up a business card for a London-based sign writer who specialised in narrowboats and decided to check out her website. Hannah’s gallery features some traditional styles of narrowboat decoration of course, but it also shows a large variety of modern fonts and styles that I thought looked really smart, so I got in touch to ask about prices. Of course anything done bespoke and by hand is going to be more expensive than something spit out of a large format printer, but I was actually surprised that the costs were reasonable. Sure it was more than the graphic artist + vinyl sticker option, but not crazy more. And it promised to be a much nicer job. I’m not against new methods. I've got solar panels and LED lighting and streaming Netflix, so this is a thoroughly modern boat. But getting this done properly, by hand, somehow just felt right. Many emails were exchanged that eventually resulted in the lovely Hannah arriving on Monday morning with a small backpack containing the tools of her trade. We’d already agreed on the design, and she’d hand drawn a new image of the nickel that was absolutely perfect. She then had the whole layout printed in full scale so we could spend a bit of time faffing around positioning the printout on the side of the boat, debating whether it should be half an inch higher or lower, until I finally agreed and disappeared to let her get on with it. The paper layout in position. The process itself was interesting. She used a piece of carbon paper sort of stuff and a straight edge and a steady hand to press through the printout and transfer the outline onto the side of the boat. 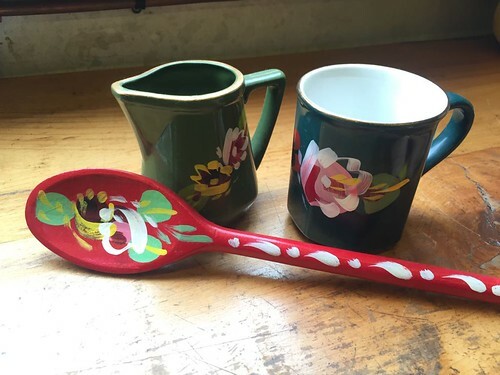 After that, she simply sat on the towpath with her tiny pots of paint and her even tinier brushes and meticulously filled in the whole thing. And she never even went over the lines! It took a bit more than two days, with a short break on Day Two for me to fire up the boat and turn it around so she could do the other side. Hard at work. At least it was sunny the first day. The end result is fantastic. I’d originally thought the lettering should curve around the nickel, but this layout was one of Hannah’s suggestions and it’s much much better. Astoundingly astute Go Stay Work Play Readers may recognise that font as a knock-off of the one used on all Transport for London signage. It’s the tube font! This is NOT photoshopped! This is just pure, un-re-touched, hand painted awesomeness. I can’t tell you how excited this makes me. It’s like the boat is finally properly reborn. And I couldn't resist this bit of fun. After all, I did say I was using the tube font! And this is definitely not a gap you want to ignore! Me and my colour coordinated boat. Happy happy. 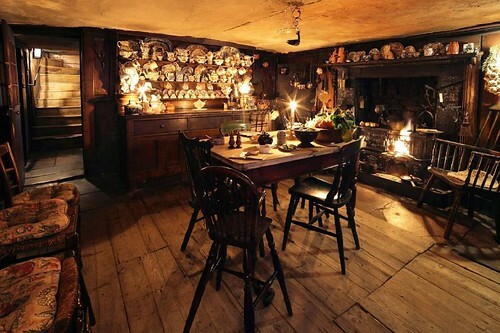 Dennis Severs’ House is… unique. Outwardly unremarkable except for the gas lamp burning above the door, it’s an early 18th century Georgian terraced house in the Spitalfields area of London’s East End. More remarkably, all five levels of the house - from basement to top floor - have been painstakingly dressed with period furniture and props to replicate life as it might have been for several generations of a family of Huguenot weavers in the 18th and 19th centuries. More remarkably still, and much less prosaic, the house is often described as a “still life drama”. 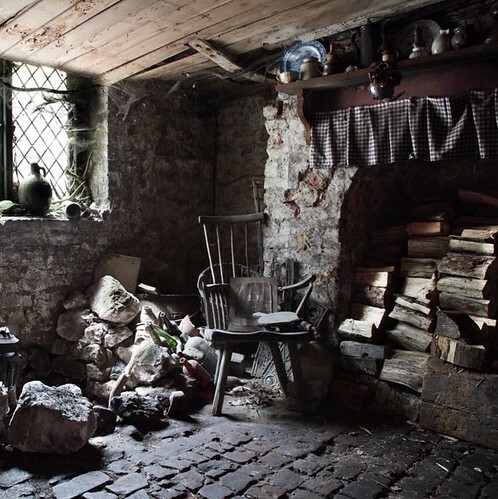 It’s the work of Dennis Severs, an American born ex-pat who relocated to England in the mid-sixties and subsequently bought and moved into the house on Folgate Street in 1979. At the time Severs bought the house it had not been modernised, lacking electricity service or contemporary plumbing. But rather than renovating or restoring the house Severs decided, in his own words, to “… bring it to life as my home. With a candle, a chamber pot and a bedroll, I began sleeping in each of the house's 10 rooms so that I might arouse my intuition in the quest for each room's soul... Then, having neared it, I worked inside out from there to create what turned out to be a collection of atmospheres: moods that harbour the light and the spirit of various ages in Time.” As you might be able to detect, Dennis Severs was not, by any means, a conventional anthropologist, social historian or museum curator. And the work he created in the house lies somewhere between museum and performance art, albeit without actors, hence the term “still life drama”. With such an unconventional patron it's no surprise that a visit to Dennis Severs’ House is not intended to be as simple as pitching up, staring at some artefacts behind glass, reading a few carefully researched explanatory cards, and then finding the nearest pub. Severs intended the experience to be much more. Visitors are admitted in small groups, told to turn off their phones, and asked not to speak at all during the visit. No photography is allowed. 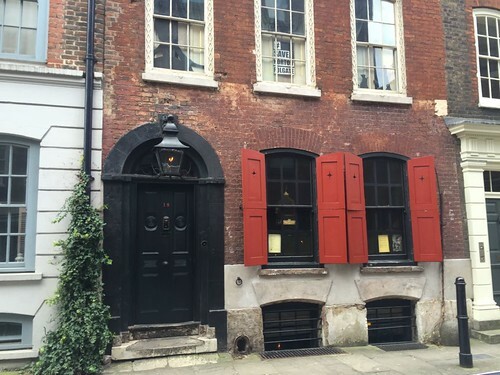 (Meaning that all the interior photos in this post are from the official Dennis Severs’ House Instagram page.) The rooms are lit only with candles, firelight and whatever sun filters in through the windows (though I think it would have been improved if the curtains had been closed to block out the modern views outside). Visitors are thus encouraged to enter into the world of the Huguenot weavers I mentioned earlier: the Jervis family, a creation of Dennis Severs’ imagination. 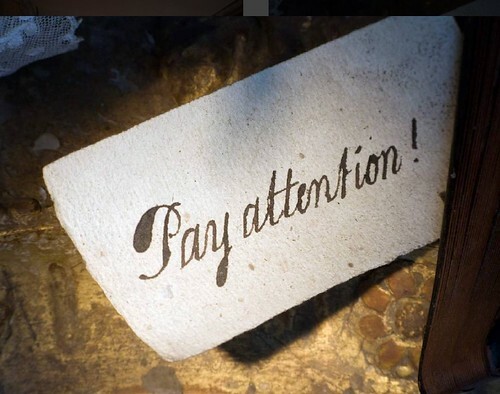 "The game is that you interrupt a family of Huguenot silk weavers named Jervis who, though they can still sometimes be heard, seem always to be just out of sight. As you journey off into a silent search through the ten rooms, each lit by fire and candlelight, you receive a number of stimulations to your senses. It is the smell of food that first aligns your imagination with the faces around you in portraits. Then… Mr. Jervis’ wig, is it not the very same one that hangs over the back of his chair? His meal is only half eaten; did he abandon it when he heard us arrive?" As you might expect from the above quote, there are none of the usual explanatory cards I just mentioned. You simply wander through each room, starting in the basement and moving up, and spend as much time as you want absorbing the incredible detail of each space. And the detail is impressive. Real coal fires burn in the grates. A half-drunk glass of sherry sits on a side table. A book of prayer lies open to the correct day’s date. And the flowers in vases are real and fresh. As a person who sometimes deals with historically detailed props in a professional context (and no slouch in the coal fire department either) even I was impressed. Add to that there’s the evocative smell from those fires and a very subtle soundtrack playing in each room. Considering it's the work of one man with a very limited budget and no formal training it's frankly astonishing. Starting in the basement, you first enter the kitchen. It’s crammed to its very low ceiling with the kind of detail that gradually becomes familiar as you move through the house. There’s a bowl of flour with fresh egg shells on the table, and a plate of sugar mice on the sideboard. Dishes are stacked and waiting for use, or sit waiting to be washed at the sink in the corner. Every surface is full and worthy of examination. Next to the kitchen is a bare and cold cellar with cobbled floor that’s partially torn up allegedly showing the archeological fragments of St Mary’s Spital, AD 1197. The tableau is striking. 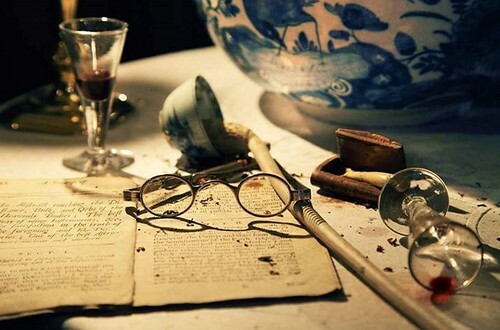 The ground floor consists of a front sitting room and dining room, where a pomegranate lies split open on the table, alongside other delicacies like whole glace oranges and items of everyday life - correspondence sitting open near a pair of reading glasses. The next floor holds the Smoking Room, portraying a three dimensional copy of the Hogarth painting on the wall above the mantle “A Midnight Modern Conversation”, depicting a drunken party with chairs pushed to the floor, bottles overturned, and wine spilled on the table. The main bedroom features a large fourposter bed and bed curtains but the bed itself is unmade as if the occupant just woke up. Near the window a lady’s dress stands on a dressmaker’s dummy with a small note pinned to the bodice reading “Let out here”. Perhaps most startling is the top floor, made up as a pair of very rundown lodging rooms rented out by the Jervis family, who, like the house itself, must have fallen on hard times. It’s hard to tell what’s staged and what is evidence of the structure literally crumbling around you. 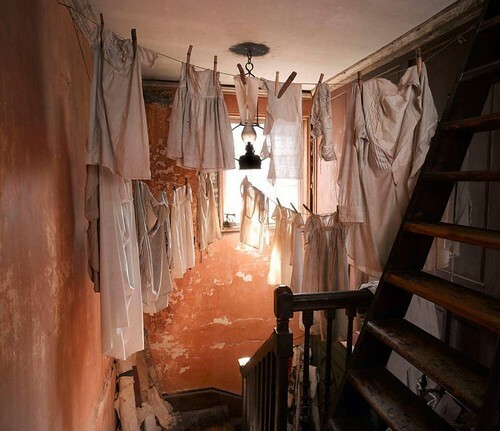 Laundry hangs drying in the stairwell, and areas of the ceiling have collapsed exposing the wooden beams behind. And if it gets quiet enough you can hear guns firing steadily on the soundtrack. They’re a salute to the dead King William IV, signalling the accession to the throne of Queen Victoria. I genuinely thought this was an exceptional work of taxidermy until it moved. Apparently Madge the cat lives in the house! "Reminder. Every object in the house should be seen as part of an arrangement. Each array tells a story. To pick up an object in a shop is a risk, in a museum it is impossible; in a private house, particularly this one, it is simply insensitive - numb to Mr. Severs' vision." These notes are scattered around the house, tucked into tiny corners. Another near the front door says: "Make no mistake... In this house it is not what you see, but what you have only just missed and are being asked to imagine." Unfortunately, I fear I simply don’t have the temperament to make the most of this sort of thing. This is not to say I didn’t find my visit worthwhile and enjoyable, though there are a few off notes. For instance, despite the espoused time period of the house, there was a coronation portrait of Queen Elizabeth II above one mantle. And I cannot fathom why there was a modern bottle of micro-brewed beer, complete with UPC coded label, on a shelf in the front sitting room. I was so puzzled that I actually asked a staff member about it as I was leaving, thinking that perhaps some even less reverential guest than myself had left it there as a joke. The only answer I got was, “I don’t know. Dennis was…” Yeah. Fill in that blank. Though whatever one might think of Dennis Severs, you have to give him credit for creating a remarkable time capsule. And you have to be grateful to the Spitalfields Historic Buildings Trust, an architectural preservation charity, to whom Severs bequeathed the house shortly before his death in 1999. So I did enjoy my visit, though it was short. The whole tour, even taken at an appropriately contemplative and leisurely pace, only takes about 45 minutes. 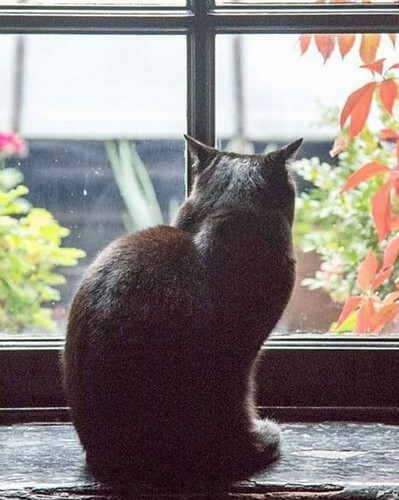 By that time I was feeling thoroughly chilled by the effects of lingering in an old draughty house heated only by less-than-roaring fires and was very ready for lunch. Luckily, the nearby Spitalfields Market has such an array of food choices it was slightly overwhelming. I’d planned to simply hit a café and fill up on coffee and pastries, but was so hungry that I got a single meatball slider from a food truck, just to take the edge off. And that slider... it was beyond good. It was amazing. It was transcendent. Eating that meatball slider was like looking into the face of God. And I did eventually find a café, and after that even paid a short visit to Christ Church Spitalfields, a Nicholas Hawksmoor church from the 18th century, which turned out to be really nice. They recently completed a very thorough renovation and it’s in fine fettle these days and well worth seeing. Even the crypt is open and is now warm and bright and tidy and has a café and free wifi and public toilets. Well done CCS! And then I found my way back to Liverpool Street Station (which, by the way, has overtaken Oxford Street Station in my personal league table of Tube Stations Most Likely to Disorient You Upon Exiting). And in a supreme act of willpower the level of which is usually reserved for hunger strikers and Leaf fans, I did not stop for eleven more meatball sliders.